Plaque showing the events of the day. (96K JPEG) Oradour-sur-Glane, about twenty kilometres away to the north-west of the city, had originally been a typical sleepy country village alongside the Glane river. But on the 10th June 1944, in retribution for various acts of sabotage carried out by the Resistance, an SS company encircled the village and assembled all of the population, including some visitors, for what at first appeared to be a routine identity check. But, once it had been ensured that everyone was accounted for and that there would be no witnesses of what was going to happen, all of the villagers were separated and locked away: the women and children in the small stone church, the men in various barns and garages throughout the village. In the inevitable conclusion, after what must have been an agonising wait, the assembled villagers were massacred by guns and grenades before their buildings were set on fire. After most - but not all - had been killed, the Germans proceeded to demolish every building in the village, including those in which some of the victims still remained alive, by explosives and heavy gunfire. One can only assume that the object of the operation was «pour encourager les autres» (or more appropriately «discourager»), as the then German leader's inspiration would have quoted. But if that were the intention, then why kill everybody? - surely it would have been better to make an example of some and leave the remainder to spread the word. Whatever the plans, some of the villagers did indeed manage to escape, five men from one of the barns and one lone woman from the church, to witness what had happened. By nightfall that day, after the SS had departed, the entire village was in ruins and all the remaining population - 197 men, 240 women and 205 children - lay dead, still locked inside their barns and the church. Memorial outside the church, where the women and children were imprisoned. See below for a transcript. After the war, General de Gaulle declared the village a national monument, to be maintained indefinitely both as a memorial to those who had died and as a reminder to others. And so it is still in this state today, enclosed by a high stone wall and with a new village having been constructed a short way to the west. Apart from a few people at each gate, there are no guides or officials here; visitors are left to wander around and form their own conclusions. The only instructions are not to enter the buildings and to maintain a dignified silence: a very reasonable request, although some of the more inconsiderate visitors seemed to be oblivious to that. Panoramic view of the village green. The small "building" to the right is one of their two wells («puits»), protected by a roof and with the winder and rope still in place. (73K JPEG) Today I entered the village through the eastern gate, and climbed up the hill to the old market square alongside the church. And it was indeed in much the same state as it had been after that fateful day 53 years ago, with most of the buildings in the typical rendered brick to be found everywhere in this region, but almost all of them roofless and still blackened by the fire. Some work has obviously been done since then, making the still-standing walls safe and clearing some of the rubble from the interiors, but all the indications of a traditional village life still remained: scales and trays in the butcher's shop, cars and carts in various states of repair in the garages and yards, a weighbridge mechanism still connected to its platform outside, and various bicycles and the ubiquitous foot-operated sewing machine in almost every house. The more unrecognisable buildings and shops were identified by a plaque, but most of the others are still recognisable for what they once were. The victims are buried in the cemetery to the north of the village: the identifiable ones in family graves, and the others in a mass grave beneath the black marble monument. Around this monument were listed the names and ages of all the martyrs, in most cases entire families from babies in arms to the oldest grandparents. In an underground exhibition room nearby, some smaller artifacts found in the buildings and on the bodies of the victims were preserved: crockery and ornaments, bottles melted and distorted by the fires, watches all stopped at nearly the same moment, identity papers and all of the other small items that until then had just been a normal part of life. View of the cemetery, with its family graves and vaults, and the memorial tower behind. Buildings facing the village green; note the car to the right and the tram wires (along the main street) visible above it. (91K JPEG) The biggest surprise here was the tramway running along the main street, with its catenary wires still hanging from the posts: this was obviously an important means of transport in those days, running from Limoges through to Confolens, although nowadays it has completely disappeared apart from the short stretch here. There was a small station opposite the «Mairie», with the tracks and a small goods siding still in place and still displaying the station name on the shelter. It was very moving to be here, even so long after the event: a reminder of what could so easily have happened on the other side of the Channel had it not been for our determined air forces and distracting events elsewhere. Everyone who believes that a nation should not have whatever armed forces and weapons are necessary to defend itself against invasion, or who thinks of civilian resistance as some gallant pursuit against an uncomfortable enemy who will soon be driven out, should be made to visit here - this graphic illustration of the consequences will hopefully dispel their romantic but dangerous notions. Please do, and form your own conclusions. Just do the world a favour: leave your *&^**$$* camcorder at home! The village is situated about twenty kilometres to the north-west of Limoges (approximately 45°57'N; 01°02'E), on the D9 road. It should be marked on any reasonable map. During the tourist season it is open from about 09:00 through to early evening, every day; I would recommend that you allow yourself at least 2 hours to visit. There is no admission charge, although there is a stall selling (reasonably tasteful) guidebooks and postcards. A web search will turn up many, but the best site that I have found describing not only the events of the day at Oradour but also the background and subsequent events is Michael Williams' excellent www.oradour.info. 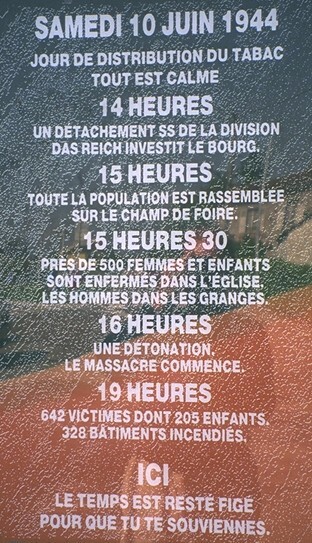 Ici des centaines des femmes et d'enfants furent massacres par les Nazis. Vous qui passez soyez recueillis. Vous qui croyez faites une priére pur les victimes et leurs familles. 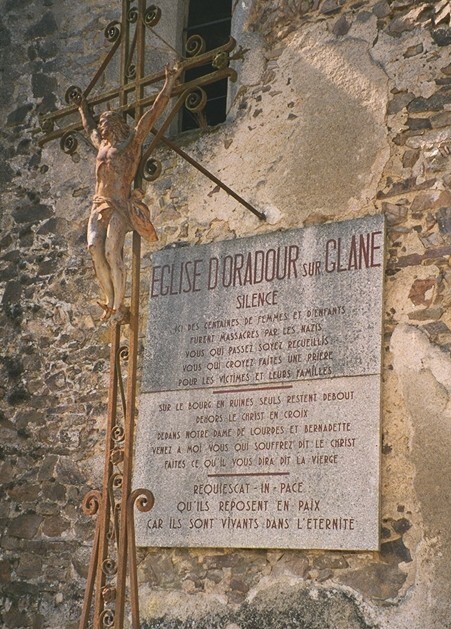 Sur le bourg en ruines seuls restent debout dehors le Christ en croix, dedans Notre Dame de Lourdes et Bernadette. «faites ce qu'il vous dira» dit la Vierge.